During that first recital, the discrepancy between Grigoryan’s short physical stature and the sheer power of her sound had the audience palpably dumbstruck. 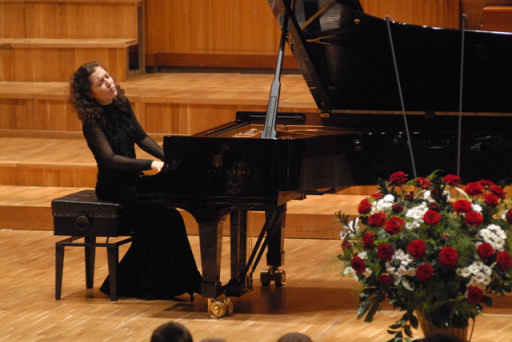 Yet the second recital made it even more clear that there is much more to her sound than power: it is as rich as her extensive repertoire – Grigoryan has touch that is both confident and sensitive, modest and commanding; it seems so natural that it is utterly irresistible. Where does that magic come from? Armenia is not one of the centers of traditional classical music. Where did your interest in music come from, what is your musical heritage? It came from my parents. My mother is a musicologist, she teaches aural training and music theory at a music school in Yerevan, and my father is also very interested in classical music. In other words, facilities where you could develop your talent were available? Certainly: when I was born, in 1985, Armenia was still part of the Soviet Union, where classical music and musical education are of course an integral part of cultural life. All these stories about star pianists who had their first lessons at age 5 or earlier come to mind, whose career goals were established shortly later, and whose life was rigorously directed toward achieving that goal early on. What was it like for you? I did not start playing the piano until I was seven. Twice a week I went to the music school where my mother teaches. I was not even dead set about having to learn how to play the piano. It was simply a natural thing to do in my family. Was there a point where someone realized that here was an exceptional talent and you needed special attention and training? Not really. An important event happened when I was ten. I took part in a youth festival and won first prize. This gave me the opportunity to play Mozart’s early C major concerto with the Philharmonic Orchestra. I was also accepted into the “New Names” program, which is much like the Keyboard Charitable Trust, to which I am extremely grateful for giving young artists the opportunity to present themselves to the public. New Names also organizes concerts and tours. You have performed virtually all over the world: in South America and North America, numerous European countries, several of the states of the former Soviet Union, in Lebanon, Syria, Iran, and other Asian countries. How does an adolescent manage that? Has it prepared you for the lonely life of a concert pianist? Traveling was not difficult at all – to me, traveling is part of life. And since the members of New Names traveled together, it was not a lonely affair when I was an adolescent. When did you actually decide to become a professional pianist? How much did you practice when you were a child? And how much of your time was dedicated to finger exercises? We are told that conservatory students in the Soviet Union had to play nothing but Hanon exercises for the first year, and only if they passed a strict examination about Hanon were they allowed to continue. Was it like that for you? Certainly not. I never really decided to become a professional pianist, it almost happened by itself. As for finger exercises, I had to do them of course, but not excessively, and it was never a part I enjoyed. I didn’t practice that much anyway. At one point my mother even asked me if I wanted to quit. But in the end I continued. And today? How much time do you spend on exercises? Maybe 2O minutes a day? I regard it as finger gymnastics, but I concentrate more on playing compositions, which exercises the fingers too, obviously. I find the Cortot exercises very helpful. Altogether I have to practice more than I used to, because piano competitions are very demanding and you need such a large repertoire. What is your attitude toward piano competitions? You simply need them if you want a career. And I personally find them very, very helpful in giving me a goal toward which I have to work. What I mind is that everything has to be absolutely perfect. And having to win first prize at all costs seems nonsense to me. I also find it a pity that musicians often look at their colleagues as rivals. That creates a distance among the participants; the human element suffers as a result. That was very different when I was with New Names. How did you career go from there? Why did you end up moving to Germany? My father is an astrophysicist who was in an exchange program with Rostock University, so he moved there in 2001. It made sense for me to study in Germany too, because it is part of the classical circuit. I planned on going to Cologne, but first joined my father in Rostock, in 2004. Then I met Professor Matthias Kirschnereit, who has been my teacher ever since, and I never left. Does that mean you are actually still a student? What an amusing thought. You are coming out with a CD in a few months, right? Did that also happen of its own accord in a way? One thing tends to lead to the next. I won the Piano Campus competition and was invited to perform at the Salle Cortot in Paris in March, which went well. The recital was organized by the Festival d’Auvers-sur-Oise, which is also going to produce a CD, that’s correct. But I don’t know yet what I want to record. What about models? You seem to be so much at home in so many different musical periods, are there any composers or pianists whom you particularly admire? I greatly admire Sokolov, and Argerich too – she has so much power. Horowitz of course. Brendel for Beethoven. For Bach, I am still fascinated by Gould. When I was younger, Bach wasn’t all that important to me. Now I realize that he was a composer of whom you never get tired. There is something objective about him, almost something therapeutic. He radiates calmness and peace. I was involved in a production by the Theater of West Pomerania, where the Goldberg Variations were performed as a ballet in Greifswald, Cottbus, and other German cities. To me, this music combines discipline and joie de vivre. I also feel very close to Rachmaninoff. I love his own recordings. Ashkenazy is also wonderful, and I think Horowitz’ recording of Rachmaninoff’s third, and Richter’s of the second piano concerto, are marvelous. Do you only listen to classical music? No! I also listen to popular music – after all, I like to go dancing. What are other favorite leisure activities of yours? I read a lot – world literature, and lately also a great deal of psychology. There is more to life than music, and whatever I learn and experience, the good and the painful, moulds me not only personally but also has an impact on my music. Throughout the interview I found that I wanted her to go off on a tangent, to talk about subjects that are not directly related to music. Now I know why: she seems so deeply rooted and curious about the world that her life appears to have a momentum of its own, and that she takes the various steps in her development in her own stride. This goes hand in hand with her utter lack of pretense and her deep humanity – and that, I suspect, is at the root of this pianist’s sound.